Welcome to Luxembourg! Your Suite Ship® is Ready for Boarding in Remich. Flights into Luxembourg City must arrive by 3 pm. 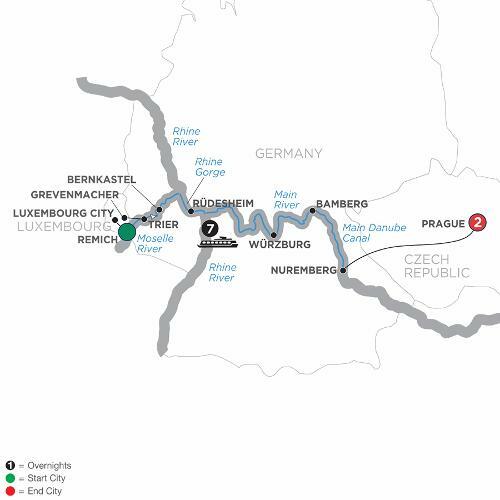 The day is yours to explore Remich—the Pearl of the Moselle—with panoramic views of surrounding forests and vineyards. Enjoy dinner on board and an evening cruise to Grevenmacher. ACTIVE Join your Avalon Adventure Host for an early Morning Run in Grevenmacher on the banks of the Moselle River in beautiful wine country. Later, enjoy live entertainment on board while cruising to Bernkastel. ACTIVE Join your Avalon Adventure Host for a Guided Hike to nearby castle ruins. Take your morning coffee up to the Sky Deck as you cruise through the magnificent Rhine Gorge. ACTIVE Take an open-air Cable Car Ride to the Niederwald Monument. Ride or walk back down through the vineyards. Spend free time biking through the beautiful Bavarian village on the Main River shores. CLASSIC Take a Guided Tour of Nuremberg’s medieval architecture, gilded fountain, gothic cathedral, and Kaiserburg Castle. Your vacation continues with a transfer to Prague. CLASSIC Take a Guided City Walk to visit Hradcany Castle Grounds; see St. Vitus Cathedral, and Astronomical Clock. Later, you may decide to join a Guided Optional Excursion as your expert local guide reveals the secrets of Prague with a visit to Charles Bridge and Malá Strana—two of Prague’s most romantic and picturesque spots. Embark on your European river cruise in Luxembourg on the enchanting Moselle River. Make your way to the ancient city of Trier, Germany—believed to be even older than Rome. Many remnants of ancient Rome can still be found, such as imperial baths and the Roman Bridge. The wine village of Bernkastel, with Germany’s largest expanse of vineyards, will fascinate you with its narrow streets and half-timbered houses still standing from the Middle Ages. Continue through the dramatic Rhine Gorge—considered the most beautiful stretch of the Rhine River—and see the rock of the Lorelei and ancient castles standing majestically on cliffs 400 feet above the water. Stop in Rüdesheim, a quintessential Rhine Valley wine town, before proceeding into the Main River. Visit the magnificent Bishop’s Residenz in Würzburg and marvel at medieval Bamberg, a UNESCO World Heritage Site. Your journey concludes in Prague, one of Europe’s most magical cities. See its treasures, such as St. Vitus Cathedral, a gothic masterpiece that dominates the skyline, the Astronomical Clock, and Charles Bridge—the oldest bridge in the city. In your free time get a taste of the local cuisine with plum dumplings and Pilsner—the perfect ending to this unforgettable European river cruise vacation! Gateway city for arrivals is Luxembourg.